﻿- Do you want to experience the breathtaking views of the giant icebergs in Greenland? - Do you feel like hiking in the active volcanoes of Iceland? - Do you want to join a photo-tour in Kamchatka? - Do you want to feel the most beautiful isolation in the deserts of Namibia? - Do you want to be amazed by the Aurora Borealis in the arctic? WE BUILD THE TRIP YOU NEED!!! 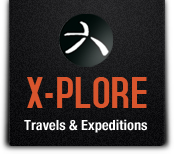 Let's experience trips of a lifetime with X-plore, an adventure travel company based in Barcelona (Spain). Check out our selection of unique expeditions and join scheduled small group adventures, create your tailor-made trip, or let us give you the best advices to build wonderful trips. Travel with us to the world's most spectacular, remote and mind-blazing places. Explore the world of true adventure.